The programs listed on this webpage are Non-CSUN Affiliated Study Abroad Programs. Please note, if you study abroad through an external organization and not a California State University affiliated program, you will do so as an independent student since external study abroad organizations are not affiliated with California State University, Northridge (CSUN). If you study abroad through an external study abroad organization, you will need to inform Admissions and Records that you are taking a leave of absence if the program is during the regular CSUN semester period. Students are encouraged to fill out the Independent Program Form prior to exchange to allow the International and Exchange Student Center to further assist in case of an emergency. Below is a list of independent, non-CSUN affiliated programs. If interested, please contact these organizations directly. Please note, if you study abroad through an external organization, you will do so as an independent student since external study abroad organizations are not affiliated with CSUN. In addition, you will not be eligible for financial aid through CSUN. 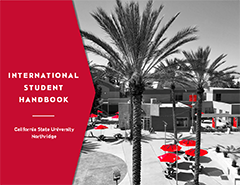 If you are studying abroad in a program not offered through CSUN and you want to check in advance that CSUN will accept credit from an international educational institution, you need to check with the relevant staff member, according to your last name, in International Admissions & Evaluations. It may take some time for the classes you take overseas to be transferred to your CSUN transcript. Therefore, please check the timeframe with the overseas institution. This is especially important if an academic advisor has confirmed that one or more of the courses that you take overseas will count as a prerequisite for a class you plan to enroll in the following semester. Likewise, if you plan to graduate within six months of returning from studying overseas, please be aware that it can take some time for your courses to be transferred. This may delay your graduation. If you want to know where you stand with transferrable GE's before you depart for their exchange, complete a Pre-arranged Credit for International Scholars form. This form must be completed in full and returned to the International Admissions office prior to your departure. When you return to CSUN, you must submit an official foreign transcript to the International Admissions & Evaluations Office. The International Admissions & Evaluations Office staff will evaluate the official foreign transcript, put the courses in your CSUN Degree Progress Report (DPR) and place the GE courses. Also, any courses taken at an accredited university (accredited by the country's Ministry of Education) will be added to your DPR even if the courses are not helpful in terms of moving you toward graduation. When you return to CSUN, you must first submit an official foreign transcript to the International Admissions & Evaluations Office. The courses taken overseas are then added to your DPR. If you want a course you have taken overseas to count towards your major, you must contact an academic advisor in your department and go through the course substitution process. You will need to provide a course description or syllabus to your academic advisor.